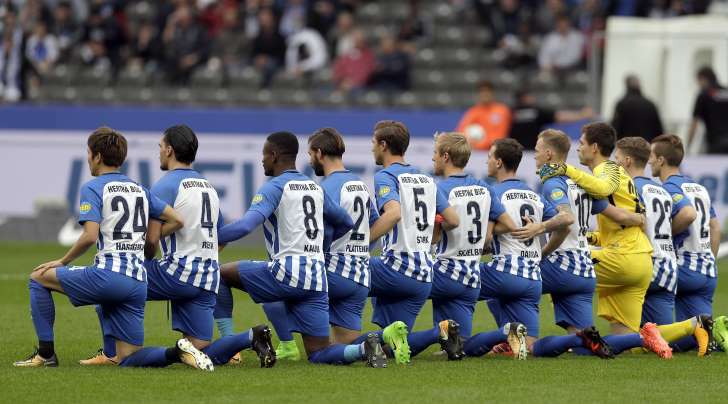 Hertha’s starting lineup linked arms and took a knee on the pitch, while Pal Dardai’s coaching staff, general manager Michael Preetz, club officials and substitutes took a knee off it before playing Schalke. The action was intended to show solidarity with NFL players who have been demonstrating against discrimination in the U.S. by kneeling, sitting or locking arms through the anthem before games. Last year, former quarterback Colin Kaepernick started the movement, which has been harshly criticized by President Donald Trump.